There have been reports of large series of patients with CVI in developed countries while there is paucity of studies from developing nations like India where visual impairment in pediatric age group due to CVI may be underestimated and underreported.,,,,,,,,,, The goal of this study was to determine the causes of pediatric CVI and its associated neurological and ocular findings. The prognosis of children with CVI was determined by assessing improvement in visual function as determined at follow-up visits. Records of patients evaluated during 2006–2012 with a diagnosis of CVI (International Classification of Disease [9th edition] 377.75) were identified through a search of outpatient records from clinical management software records. This code is for “cortical blindness” but is used for CVI. The Institutional Investigational Review Board approval was obtained. The records from pediatricians and pediatric neurologists were reviewed at the time of patient evaluation. All children were examined by pediatric ophthalmologists, and comprehensive examination including pupillary reaction, the presence or absence of strabismus, nystagmus, opticatrophy, and cycloplegic retinoscopy was recorded. The diagnosis of CVI was based on an ocular examination that revealed poor visual function bilaterally that could not be accounted for age, ocular examination findings, optic atrophy, or high refractive error. When patients had coexistent optic atrophy, retinal abnormality, and CVI, a clinical decision during the examination was made based on the primary reason for the visual loss. Every patient had either computed tomography (CT) or magnetic resonance imaging (MRI) neuroimaging done. Few patients had brainstem evoked response audiometry (BERA) and flash visual evoked potential (VEP) reports with them. Visual responses in infants, young children, and older children who could not identify letters or pictures were assessed by Cardiff card acuity testing (UK) and by their behavioral responses to light, moving objects. In older children, visual acuity was assessed using isolated optotypes (Snellen letters, HOTV cards) depending on verbal skills. In our study, we used modification of the six-level scale previously described by Good., The modification of Good classification for visual function was used by Khetpal et al. which is practically more useful in children with CVI. The difference between Level V and Level VI is that the child was able to provide recognition acuity for Level VI. The records of 120 children with the diagnosis of cortical blindness were reviewed, and 90 children were diagnosed with CVI, other 30 children were excluded because on follow-up 20 had been diagnosed as delayed visual maturation and 10 children of CVI were not having any imaging done. Out of 90 children, there were 53 (59%) males and 37 females (41%). The mean age at presentation was 19 ± 17.21 months (range 2–96 months). The mean age at follow-up was 29.05 ± 25.61 months (range 8–108 months). The mean duration of follow-up was 13.5 ± 10.4 months (range 2–60 months). Forty-eight children were born full term with normal delivery, 21 were premature (20 born by cesarean section [CS], 1 by vaginal delivery), 14 full term were born by CS, 7 were born with history of difficult labor. Out of 90 patients, 20 had records of perinatal stress. Visual function was poor in most children. In our study, 79% of the patients at initial presentation had Level I or Level II vision acuity [Table 1]. Sixty-seven (74%) patient had Level I vision while only one patient had Level VI vision, respectively, at initial presentation. On initial presentation, only one patient had recognition visual acuity recorded on Snellen chart (Level VI), and five were able to pick cake decoration balls (Level V). On final follow-up, one had vision recorded with Cardiff card (both eyes 6/60), and eight had vision recorded with Snellen chart (Level VI). On follow-up, 35 patients were in Level I, 14 had Level II, 32 had Level III, IV, V while 9 patients had Level VI vision acuity. At final follow-up, 54% had Level I or Level II vision acuity. Thirty-two patients were followed for 1 year and more than 1 year [Table 2]. The [Figure 1] graph depicts the visual acuity at initial presentation and at final follow-up. The visual stimulation was done by running light, computer-based visual stimulation exercises, bright toys, and colored beads at low vision clinic on multiple visits. While home-based exercises were with bright toys and running light which displays multiple colors in various patterns and usually kept near cot of child. The visual stimulation exercises were explained by low vision rehabilitationist to parents. Parents willing to come to low vision clinic for stimulation therapy were given exercises in low vision clinic. Many patients (61%) had multiple etiologies. [Table 3] describes etiological factors of CVI. The most common etiology was perinatal hypoxia (29%). This was followed by prematurity (26%) and structural abnormalities (22%). The associated ocular and neurological findings in our patients are summarized in [Table 4] and [Table 5]. Two patients had auditory neuronal hearing loss, 2 had BERA showing auditory pathway dysfunction. Five patients had VEP records with them showing prolonged P100 and decreased amplitude. In our study, 34% had ocular finding. Sixty-six patients had normal fundus, 20 had disc pallor, one patient had bilateral subretinal hemorrhages, one had optic nerve head hypoplasia, and one had Herpes Simplex retinitis and one had laser-treated retinopathy of prematurity in both eyes. All the patients had CT or a MRI reports with them which were done in different radiology centers. Most of the patients with neuroimaging had damage to both gray and white matter with cerebral, cortical, subcortical atrophy, and paucity of white matter. The most common findings were ischemic encephalopathy (31%), periventricular leukomalacia (28%), cortical and subcortical atrophy, and structural malformations (22%) such as agenesis or thinning of the corpus callosum, porencephalic cyst, lissencephaly, holoprosencephaly, colpocephaly. One patient had bilateral open-lip schizencephaly [Figure 2]a,[Figure 2]b,[Figure 2]c,[Figure 2]d.
CVI pathologic processes may affect not only the primary visual cortex but also the associative areas, optic radiations, optic nerves, and even visual attention pathways. In the term infant, the brain receives its vascular supply primarily from the major cerebral arteries, and its watershed areas lie at the interfaces between the major cerebral arterial distributions. Mild degrees of hypoxic-ischemic injury produce watershed infarctions in the arterial border zones, injuring both gray and white matter and resulting in cortical visual loss. Unlike term infants, preterm babies rarely suffer parasagittal infarctions from hypoxia-ischemia and the periventricular deep white matter, is involved when the insult occurs earlier, between 24 and 34 weeks of gestation. The diagnosis of CVI remains essentially a clinical one. The possibility of CVI should be raised when there is greater delay in visual development than in other areas and when the degree of vision loss is unexplained by ocular findings. There are only a few large published series of CVI in children.,,,,,,,,,,,,,, The most common etiology seen in our series was hypoxic ischemic encephalopathy 28.8% which is similar to the report of Huo et al., Khetpal et al. and Chong and Dai also reported hypoxic ischemic encephalopathy, affecting over one-third of the children., Matsuba and Jan reported that 36% had hypoxia as the cause of CVI in 423 children diagnosed with CVI. Our series had a lower incidence of meningitis related to CVI compared to Huo et al. and Hoyt , Ocular abnormalities were also commonly seen in our patients with exotropia and nystagmus being the most common followed by esotropia while neurological manifestation included seizures, cerebral palsy, and microcephaly and hemiparesis. Huo et al. reported overall, 75% of CVI patients had at least one neurologic deficit, and 37% had an ophthalmic deficit. Brodsky et al. and Jacobson et al. also found that nystagmus occurred in a high frequency of children with PVL. The most common findings in imaging in our study were ischemic encephalopathy, followed by periventricular leukomalacia and cortical and subcortical atrophy and structural malformations, which is similar to study done by Khetpal and Donahue. Diffuse cerebral atrophy was the most prevalent CT scan abnormality in a study by Lambert and associates. 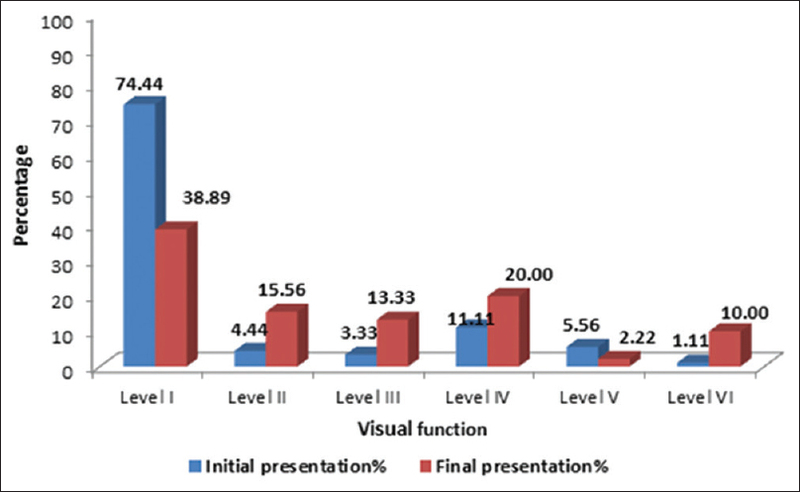 In our study, 79% of the patients at initial presentation had Level I or Level II vision. Visual acuity tended to improve slightly over time. At final follow-up, 54% had Level I or Level II vision. Less case of meningitis and encephalitis could have accounted for better vision. The differences between the values may be related to the different criteria used in assessment of vision in our study. However, factors other than cause (e.g., timing of the insult, severity) must be considered for each case. Various studies have evaluated VEP in CVI, but our study had very few cases with VEP study to reach any conclusion. To the best of our knowledge, this is the first ever study done in Indian pediatric population on CVI establishing causes, associated comorbidities, and prognosis. The availability of imaging reports in all cases makes it unique to other CVI studies done in various ethnic pediatric population in various countries. The limitation of our study is that prognosis of vision with causes of CVI were not evaluated. Long-term follow-up of these children could give different results of visual prognosis. CVI is of increasing importance as a cause of pediatric vision impairment in India. The major risk factors for CVI tend to be perinatal hypoxia, prematurity, and structural malformations. The majority of children with CVI showed some recovery but visual function tended to be poor in most children. Establishing the etiology and prognosis for these children at early age may aid in early rehabilitation of these children. The authors would like to thank Dr. Linda Lawrence (MD Ophthalmology) Kansas, USA, for her valuable guidance and Miss. Gothai N (MSc Biostat) for statistical analysis. Hoyt CS, Fredrick DR. Cortically visually impaired children: A need for more study. Br J Ophthalmol 1998;82:1225-6. Good WV, Jan JE, DeSa L, Barkovich AJ, Groenveld M, Hoyt CS. Cortical visual impairment in children. Surv Ophthalmol 1994;38:351-64. Brodsky MC, Fray KJ, Glasier CM. Perinatal cortical and subcortical visual loss: Mechanisms of injury and associated ophthalmologic signs. Ophthalmology 2002;109:85-94. Huo R, Burden SK, Hoyt CS, Good WV. Chronic cortical visual impairment in children: Aetiology, prognosis, and associated neurological deficits. Br J Ophthalmol 1999;83:670-5. Matsuba CA, Jan JE. Long-term outcome of children with cortical visual impairment. Dev Med Child Neurol 2006;48:508-12. Afshari MA, Afshari NA, Fulton AB. Cortical visual impairment in infants and children. Int Ophthalmol Clin 2001;41:159-69. Hoyt CS. Visual function in the brain-damaged child. Eye (Lond) 2003;17:369-84. Edmond JC, Foroozan R. Cortical visual impairment in children. Curr Opin Ophthalmol 2006;17:509-12. Roland EH, Jan JE, Hill A, Wong PK. Cortical visual impairment following birth asphyxia. Pediatr Neurol 1986;2:133-7. Wong VC. Cortical blindness in children: A study of etiology and prognosis. Pediatr Neurol 1991;7:178-85. Lambert SR, Hoyt CS, Jan JE, Barkovich J, Flodmark O. Visual recovery from hypoxic cortical blindness during childhood. Computed tomographic and magnetic resonance imaging predictors. Arch Ophthalmol 1987;105:1371-7. Whiting S, Jan JE, Wong PK, Flodmark O, Farrell K, McCormick AQ. Permanent cortical visual impairment in children. Dev Med Child Neurol 1985;27:730-9. Dutton G, Ballantyne J, Boyd G, Bradnam M, Day R, McCulloch D, et al. Cortical visual dysfunction in children: A clinical study. Eye (Lond). 1996;10(Pt 3):302-9. Chong C, Dai S. Cross-sectional study on childhood cerebral visual impairment in New Zealand. J AAPOS 2014;18:71-4. Rosenberg T, Flage T, Hansen E, Riise R, Rudanko SL, Viggosson G, et al. Incidence of registered visual impairment in the Nordic child population. Br J Ophthalmol 1996;80:49-53. Gilbert CE, Canovas R, Kocksch de Canovas R, Foster A. Causes of blindness and severe visual impairment in children in Chile. Dev Med Child Neurol 1994;36:326-33. Rogers M. Vision impairment in Liverpool: Prevalence and morbidity. Arch Dis Child 1996;74:299-303. Lim M, Soul JS, Hansen RM, Mayer DL, Moskowitz A, Fulton AB. Development of visual acuity in children with cerebral visual impairment. Arch Ophthalmol 2005;123:1215-20. Cioni G, Fazzi B, Coluccini M, Bartalena L, Boldrini A, van Hof-van Duin J. Cerebral visual impairment in preterm infants with periventricular leukomalacia. Pediatr Neurol 1997;17:331-8. Casteels I, Demaerel P, Spileers W, Lagae L, Missotten L, Casaer P. Cortical visual impairment following perinatal hypoxia: Clinicoradiologic correlation using magnetic resonance imaging. J Pediatr Ophthalmol Strabismus 1997;34:297-305. Good WV, Brodsky MC, Angtuaco TL, Ferriero DM, Stephens DC 3rd, Khakoo Y. Cortical visual impairment caused by twin pregnancy. Am J Ophthalmol 1996;122:709-16. Frank Y, Torres F. Visual evoked potentials in the evaluation of “cortical blindness” in children. Ann Neurol 1979;6:126-9. Khetpal V, Donahue SP. Cortical visual impairment: Etiology, associated findings, and prognosis in a tertiary care setting. J AAPOS 2007;11:235-9. Jacobson L, Ygge J, Flodmark O. Nystagmus in periventricular leucomalacia. Br J Ophthalmol 1998;82:1026-32. Swaminathan M. Cortical visual impairment in children – A new challenge for the future? Oman J Ophthalmol 2011;4:1-2. Acers TE, Cooper WC. Cortical blindness secondary to bacterial meningitis. Am J Ophthalmol 1965;59:226-9. Bosch DG, Boonstra FN, Willemsen MA, Cremers FP, de Vries BB. Low vision due to cerebral visual impairment: Differentiating between acquired and genetic causes. BMC Ophthalmol 2014;14:59. Jacobson LK, Dutton GN. 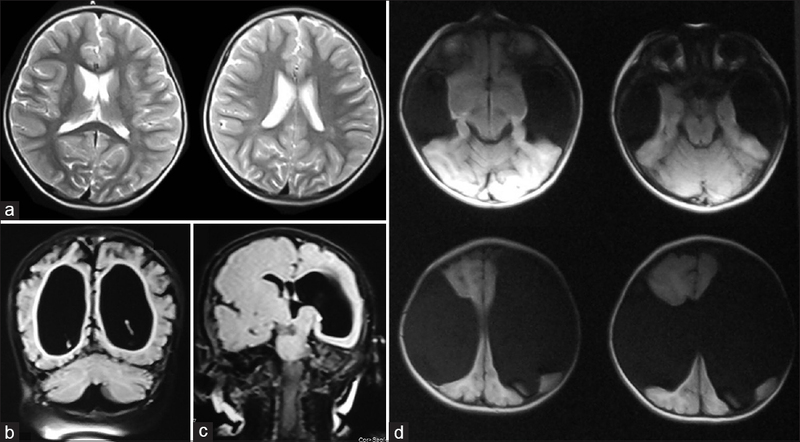 Periventricular leukomalacia: An important cause of visual and ocular motility dysfunction in children. Surv Ophthalmol 2000;45:1-13.